USPC would like to highlight the National Youth Board Members for the current term. Today we would like to introduce Kavita Bushong. Kavita is an incoming member for the 2018 National Youth board. She is on the Service and Pin Promise Committees. 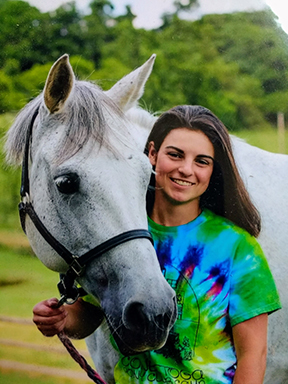 Kavita is a C-2 Trad, and H-B from Conestoga Pony Club in the Delmarva Region, and also is involved with unmounted activities in the Old Dominion Region. She is very active in her club and region, and enjoys competing in Tetrathlon. She is a freshman at Virginia Tech majoring in Dairy Science in the accelerated 3+1 Pre-Veterinary track. Her time in Pony Club inspired her to become a Veterinarian for large animals. Kavita grew up on a her family’s dairy farm, and has a wide range of animal experience. She plans on getting her H-A in the upcoming year, and continuing to event and rally with her pony.